If you’re like most small businesses, Snapchat may feel like a big social media mystery that is not relevant to market your business. You ask yourself, what good is Snapchat to me? Here’s the truth. According to new data from Edison Research, Snapchat is the second most powerful social media platform in the United States! After reading this, your next question should be “how do I use Snapchat to market by business?” We’ve put together thirteen growth-focused ideas to help you grow on Snapchat. Find the right Snapchat hack that fits your business. The growth and dominance of Snapchat might just prove it is the latest social network that you should start paying attention to. More Americans are familiar with Snapchat than with Pinterest or LinkedIn. In the past twelve months, awareness of Snapchat among Americans ages 12 and older, grew from 60% to 71%. Hard to believe since all three platforms have been around much longer. In 2013, 15% of Americans said they used Twitter. By 2016, 21% of the country claimed Twitter usage – a 6% growth rate in three years. Between 2015 and 2016, Snapchat user growth went from 17% to 23% – a 6% growth rate in just one year! 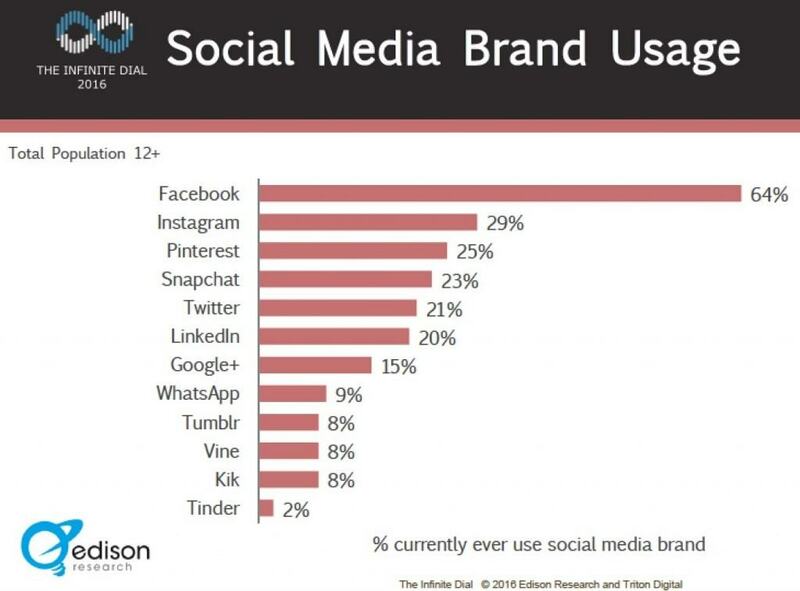 Not quite the same as Facebook’s massive 65% usage, however, the Snapchat app is second most often used platform in social networking. Instagram is third. Facebook and Facebook Messenger remain the most popular social platform among Americans 12–24 years old, with 32% saying they use Facebook most. 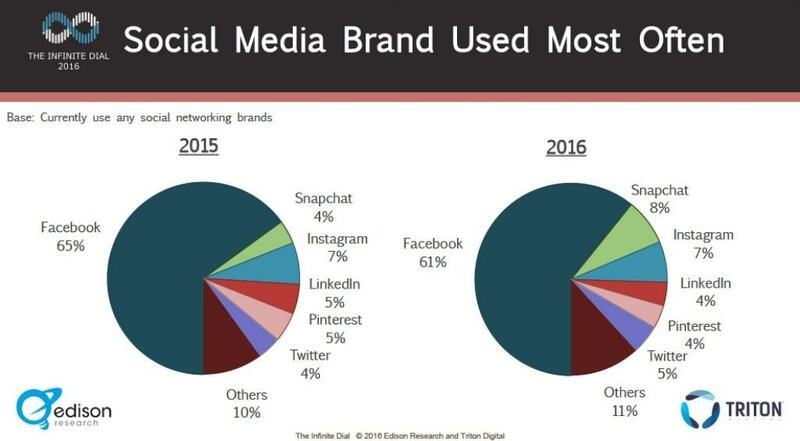 Snapchat is second with 26%, far outpacing Instagram at 17%. Snapchat is starting to look like a marketing channel with a large number of users, most of whom are engaged and willing to give you at least ten seconds of their time to view your promotions and buy from you. There are many ways you can use Snapchat to grow your business. The trick is to find the right Snapchat hack that gives you the most hope and inspiration. Each Snapchat hack below provides some guidance as to what is possible. 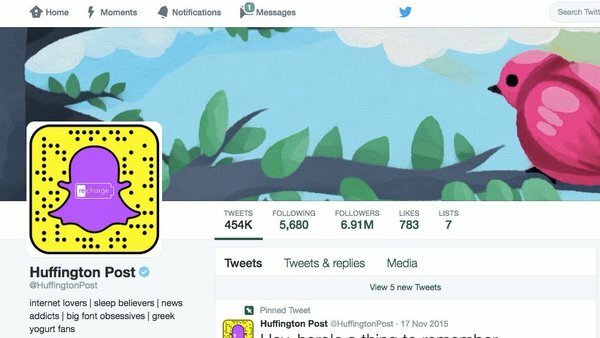 Are you noticing the Snapchat logo taking over Twitter? There’s a reason. It’s a simple Snapchat hack. Snapchat users can quickly add friends by taking a snap of the Snapchat ghost (a.k.a Snapcode). It’s no longer necessary to remember the spelling of Snapchat usernames or have someone’s phone number – snap their Snapcode to add them to your friend list. 16 Handles, a frozen yogurt brand, asked customers to take pictures while eating frozen yogurt and send it to the company’s Snapchat account. In return, participants received a discount for their next purchase. In one day, 1,400 snaps were exchanged between 16 Handles and their Snapchat followers. Followers got discounts on frozen yogurt, and 16 Handles found a way to generate repeat business. 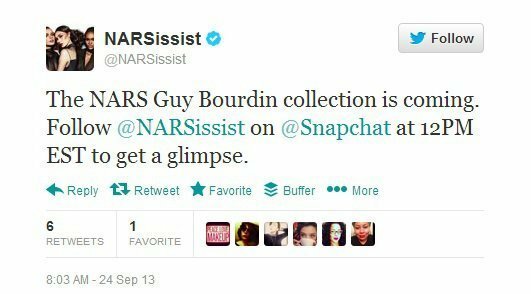 NARS, a cosmetics retailer, promoted a special Snapchat viewing to their large Twitter and Instagram following. This promotion resulted in new followers on their Snapchat account from people who were curious about the special announcement. At exactly 12 P.M. EST, NARS sent out a 3-second video snap to all their new friends. Wet Seal, a teen clothing retailer, enlisted the help of a 16-year old to help them grow their Snapchat followers. Who knows better than a 16-year-old in growing Snapchat usage! At the end of the two days, Meghan had added 9,000 new followers to the account. The chameleon effect also called unintentional mirroring, is hardwired into the brain. The chameleon effect refers to our unconscious matching of the postures, mannerisms, facial expressions, and other behaviors of our social environment. It has evolved as a way to help us get along with others. 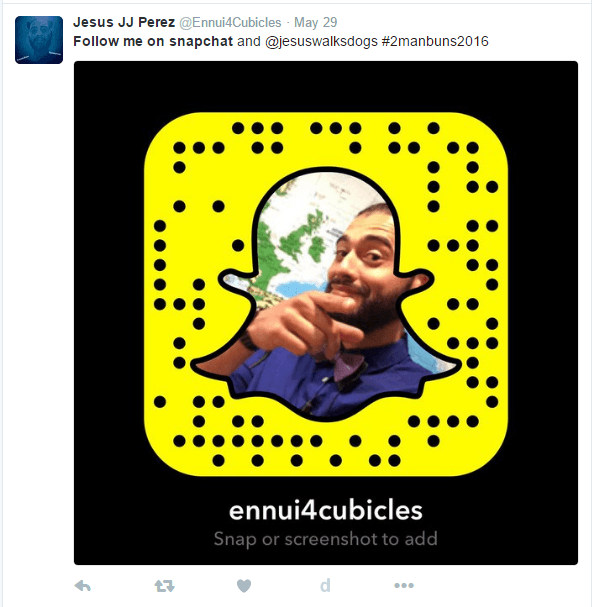 Snapchat is the perfect platform for implementing the matching and mirroring strategy. Do this exercise. Follow people on Snapchat. Follow their stories. Match and mirror their behavior. Send them a few snaps. Use this strategy and it will change the way you build connections. You can’t talk about growth hacks on new social media platforms without including contests and promotions. It is a no brainer. Think of ways you can keep your followers coming back. 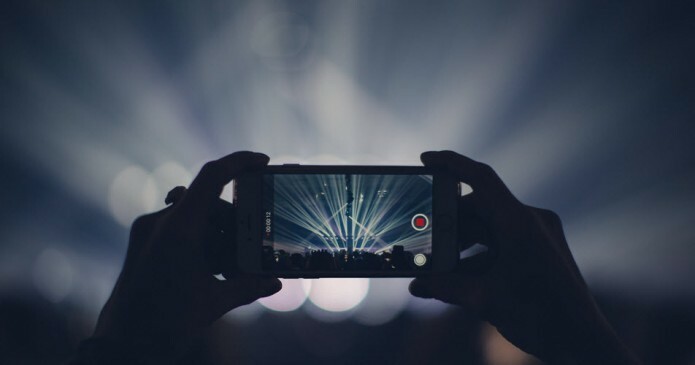 From Social Media Examiner: Offer promo codes or discounts to the fans who watch your entire Snapchat story, or ask them to take a snap while holding your product (See #2 above). GrubHub, for example, was the first brand to execute a Snapchat scavenger hunt. During a five-day campaign, they asked their followers to post a daily snap, whether it was a food selfie or a food doodle. Show off your company and make sure to highlight your culture (be authentic). Fashion brand and startup Everlane excels at this, pulling back the curtain to educate customers while producing enticing content. They use Snapchat stories to highlight tours of offices, happy hours and manufacturing warehouses. Use Snapchat Stories feature to compile short videos. This feature allows Snapchat users the option to piece together pictures and videos taken throughout the day into a slideshow. McDonalds used the feature to advertise its new Bacon Clubhouse Sandwich. The video featured NBA star LeBron James. McDonalds added bits and pieces of video and imagery to the story throughout the day. You don’t need LeBron or Stephen Curry to pull this strategy off. Just some creativity. This hack is one of my favorites. It shows Snapchat can work with any budget for any company or in this case, city. This Snapchat hack comes from Roy Harmon. I encourage you to read the entire process Roy used. He used Snapchat Geofilters. Geofilters are location-based graphics that you can place over your photo. They are a fun way to spice up your pictures and let your friends know your exact snapping location. You can create and submit a Geofilter for your business like Roy did. If someone takes a snap in the geo area you submitted, your overlay may appear on their snap. This overlay is a paid feature of Snapchat. I targeted two areas in Downtown Greenville to test Snapchat’s viability in a smaller town. 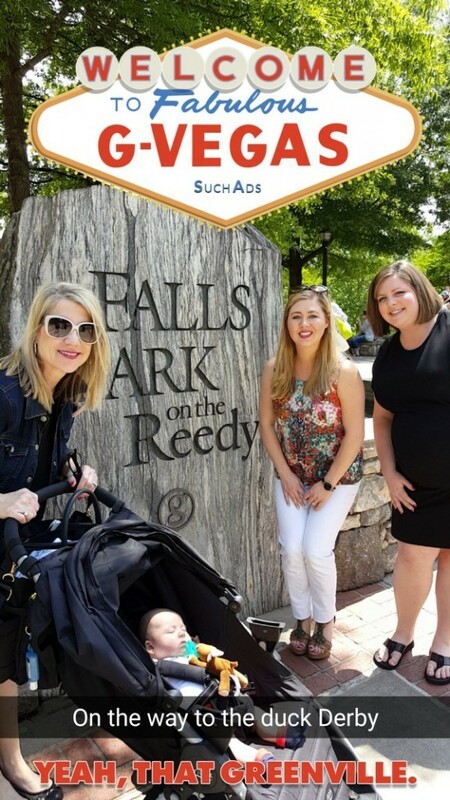 I ran two geofilters, one in the afternoon in Falls Park during an event (the Duck Derby), and one that night on Main St. Overall, I’m happy with the results. For $51.64, my filters were visible for 11 hours. They were seen 6,977 times and used 159 times. That’s less than a penny per view and about $0.33 a use. 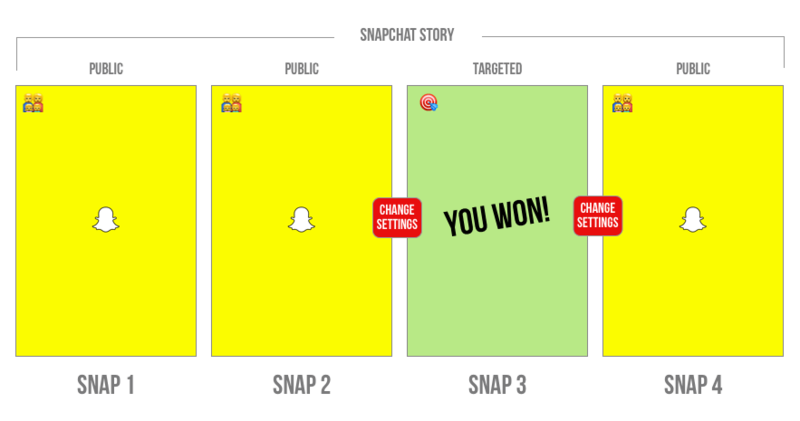 Snapchat does not offer targeting or audience segmentation…officially. But with a few simple tricks, you can get close and significantly improve engagement. This hack comes from Erik Robič. Access your permissions settings in the Snapchat app. Find the setting for ‘Who Can View‘ your snaps and stories. Change ‘Everyone’ to a select group of friends or followers. Erik suggests to keep it manageable – under 100 people. Manually add each Snapchat username to the targeted group, either by typing in usernames or using the ‘Added me’ feature. Return to the ‘Who Can View / My Story’ settings and change the value to ‘My Friends’. Chris explains how to buy legitimate Snapchat followers using Facebook and Twitter advertising. Show off your Snapchat pictures and videos on Instagram, Pinterest, YouTube, and Google+. This hack requires 3rd-party tools to archive your snaps and share them elsewhere. Add your Snapcode to your email signature. You first need to download your Snapcode. The video shows you how to get your Snapcode from the Snapchat app. Once you have your Snapcode, add it your email signature. 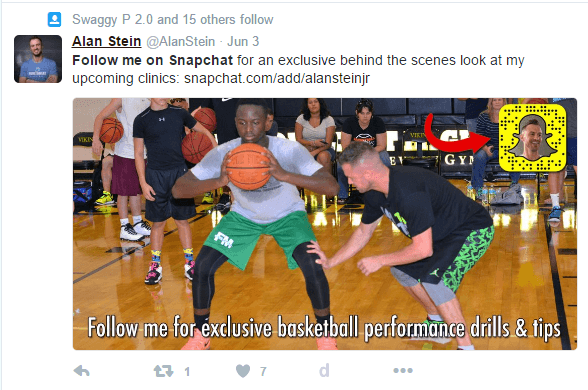 Hopefully, these thirteen Snapchat hacks de-mystify the marketing possibilities on Snapchat. Have a Snapchat hack to share? We’d love to hear them. Please add them in the comments.